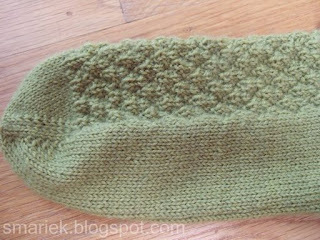 One of my readers pointed out a new cable hat pattern, Laurel (RavLink), from Jared Flood (aka Brooklyn Tweed), which would complement my Paquin Cable Scarf (RavLink) since it has cables that are similar to the ones I used in my scarf. Just thought I'd mention this in case you're interested in a matching hat/scarf set. His cable twists in the opposite direction, however it wouldn't be too difficult to twist it in the same direction if you choose to do that. You'll find the hat pattern from Classic Elite. I am feeling much better today than I have in the past few months. Still have a minor issue, but it is tolerable for now. And I'm still having difficulties staying focused on anything. 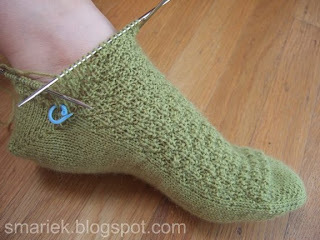 I seemed to have lost my Knitting Mojo -- has anybody seen it? -- during this time, however I'm hoping to find it again soon. I've managed to do some easy reading lately. I've finished the first 3 books in the Harper Connelly series by Charlaine Harris. It's about a woman who can find dead people. The author just came out with book 4, Grave Secret, which I will get my hands on soon! But in the meantime, I have started one of her Lily Bard books, Shakespeare's Champion, in dead-tree format ... and Donna Leon's Blood from a Stone in audio book format. The following is something I started typing up months ago but never got around to posting. Look what I've started. 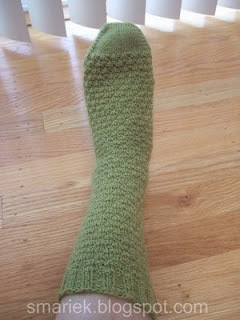 Another sock. No surprise there. However there is just one new thing here. 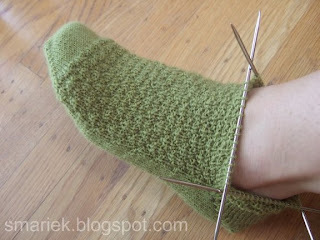 I am going to try making a sock for a foot that is larger than mine. Definitely a new challenge. I feel like I'm using The Force and hoping for the best, that this will fit the intended foot. I'm aiming to fit someone who wears a US 7.5 size shoe. Wish me luck, ok? This is the beginning, the "standard" method I've been using lately. After the first 15 pattern rounds, I wasn't quite sure I liked it. It looked boring. I muddled on anyway, hoping it might improve with added length. This is a mindnumbing knit. I am not getting as much pleasure from this as my previous pair (#7). Could it also be the green color? I'm not terribly fond of green. Yep, I chose to do a SRH again. I had no idea when I should begin it. 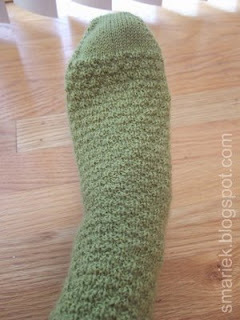 When I made socks to fit my foot, I aimed for 6.75" before starting the SRH. To fit someone with a larger foot, I decided to try 7.25". Hoping this will work out. The sock seems to fit around my foot OK. I hope it'll stretch enough to fit someone who wears a US 7.5 shoe. (I wear a US 5 or EUR 36). I've finally figured out why the leg section takes a much longer time to complete. 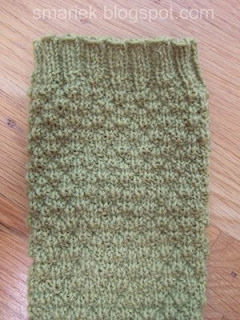 It's because I start working the pattern on the backside instead of continuing with plain stockinette. 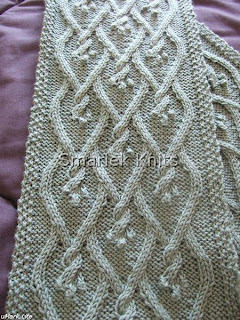 Anything I do other than stockinette will take longer. Now I know why the foot section always seems to go by faster. I was happy to finally bind off. This stitch pattern was tedious and I wasn't quite getting the stitch definition I had hoped for. 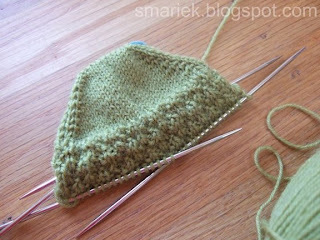 The Laurel Hat looks like a fun knit, and would make a great hat to accompany your scarf. 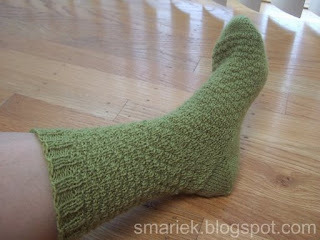 I'm kinda like you when it comes to socks, it has to have an interesting pattern, I have a hard time making vanilla socks, (even if they are self striping). Glad to see that you are doing better. Thanks for visiting my blog too, I appreciate your comment. Love green! Love these socks! Nice to see you back "in print". 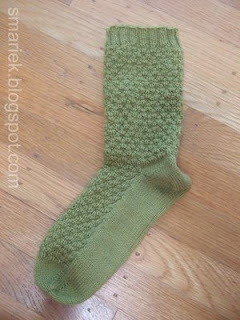 I'm a green fan myself, and I like the sock a lot. Good to see you, Marie! Welcome back! Glad you're feeling better--I was so excited to see a new post!